Christian McCaffrey and Greg Olsen might be related if a picture on Olsen’s Twitter account is any indication, and McCaffrey had a hilarious response. Christian McCaffrey seems to be fitting in well with his new teammates after getting drafted by the Carolina Panthers in the 2017 NFL Draft in April, and it looks like he may be a lot closer to one of his teammates than anyone could have thought. On Saturday, Panthers tight end Greg Olsen posted a throwback picture on his Twitter account from a Football Digest magazine featuring Olsen on the cover as the top player of the year. Ironically, the picture features Olsen wearing the number 22, the same digits that McCaffrey will be rocking for the Panthers in the backfield in this upcoming season. McCaffrey, taken aback by the huge resemblance between he and his teammate, took to Twitter to respond to his teammate, and maybe went a little too far with his response. Olsen, at 32 years old, would’ve been 11 when the 21-year-old McCaffrey was born, so it’s a bit of a stretch to jump to that assumption. However, the Panthers’ Twitter account apparently believed it, and tweeted their own response to the whole situation, channeling their inner Andy Dwyer from Parks and Recreation to show their shock. 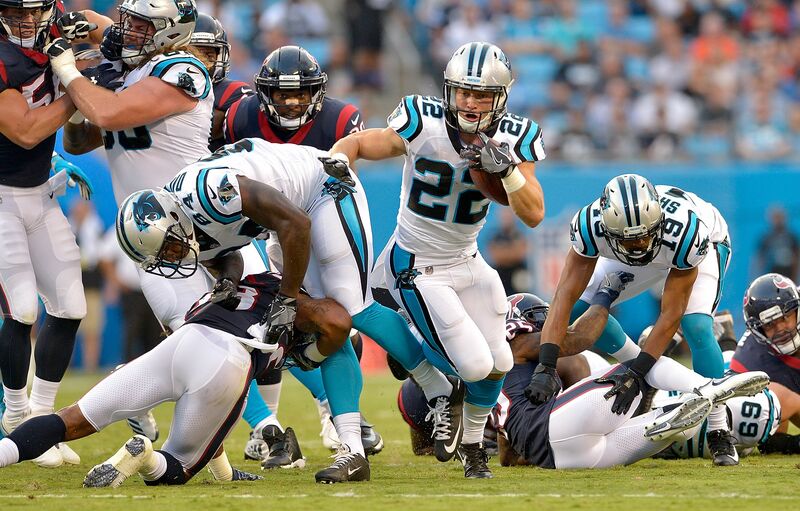 McCaffrey has been the subject of a lot of jokes when it comes to the Panthers over the last few months, including getting his interview time crashed by his quarterback, Cam Newton, in one of his first appearances in a Panthers uniform. The running back has been a solid addition to the Panthers backfield, and could be in for a breakout season in his rookie year. After a successful college career, it’ll be interesting to see if he can translate his collegiate talents and early stardom with the Panthers to the regular season. However, if his gene pool really does go all the way back to Olsen, it shouldn’t be that hard of a transition.